And if not . . .
“Whatever you’re caught in, I make you free. Whatever you’re accused of, I hand you pardon. Whatever you’re judged of, I give you release. Whatever binds you, I have broken. All sin and shame and guilt and lack I have made into beauty and abundance. “Who get over a love like this? In the midst of trials, Jesus guarantees the best trial outcome: you’re guilty, but you get no condemnation. No condemnation for failing everyone, no condemnation for not doing everything, no condemnation for messing up every day. Who gets over a release like this? How to be equipped for life? You aren’t equipped for life until you realize you aren’t equipped for life. You aren’t equipped for life until you’re in need of grace. In the moment of realizing your limitations, your shortcomings, your inescapable sins, all that you aren’t–in that moment of surrendered lack, you’re given the gift you’d receive no other way: the gracious hand of an unlimited God. Repentance, turning around, is the only way to be ushered into grace. . . .
She who turns back soonest is the most progressive. She who repents most makes the most progress–you always go farther when traveling light. She who repents of seemingly little sins knows that all sins are great–and knows a greater God. Repentance is as much air to a Christ-follower as faith. So if you turned right after Clappison’s Corner and drove real slow around the potholes, you might see it? Sneeze or blink, and yeah, you might not. 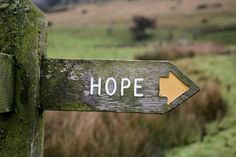 But it’s there on the top of a mossy stake, pointing the way you gotta take, either way: Hope. You don’t want to know where all the other roads lead. Just down the road from Centerton, thats’s where my Dad grew up on a dairy farm. Right around the corner from the Dykstra’s* dairy farm. Hank Dykstra had seven kids and a heart attack. Fell over dead to this world and alive to the next when their oldest boy, Richard, was only 14.Sometimes people are so quiet and brave, we forget that they are suffering. Sometimes people are so quiet and brave, we forget that they are suffering. My Dad and Richard Dysktra were both farm boys about to start high school when Richard took over the farm and helped his mom raise the six other kids and milk 40 Holstein cows morning and night, 365 days of the year. Dad said the high school bus would wait at the end of the lane for Richard and Dad would watch the door of the barn to see if Richard was coming from his cows to class. That only happened less than a handful times a month. Because sometimes the road you’re on is more important than the bus waiting out on the road that someone else says you have to take. My Dad grew up milking cows and growing corn, got married at 24, and bought a farm 3 hours west of Centerton. Richard Dyskstra grew up milking cows, raised up his 4 brothers and 2 sisters, got married at 37, and bought a farm 3 hours east of Centerton. 6 long hours of unwinding road now stretched between the two neighbour farm boys and their farms. Is success the point of Lent? I can’t seem to follow through in giving up for Lent. Which makes me want to just give up Lent. Which makes me question Who I am following. Which may precisely be the point of Lent.